Please post any and all POSITIVE reactions towards being there for our fellow Jew in light of the Pittsburgh massacre. Any nice article, or something you have witnessed or overheard....This is meant to be an inspiration, to show how our nation IS united, more than we think. This is not a place for anyone to post negativity and disdain towards Tree of Life. Stay away and think your negative thoughts to yourself please. How do we direct the overwhelming feelings of sadness, love and responsibility, that all of us are undoubtedly feeling at this time? We know that when Yaakov Avinu saw Yosef for the first time after over twenty years of absence and mourning, the first thing he did was to recite Krias Shema, as an almost instinctive reaction. The question is asked, why was this the time to recite Krias Shema? One explanation is that Yaakov felt that he must read Shema at that specific moment in order to encapsulate and capture that momentous event in his life, a moment when he was overcome with love and to channel it to Hashem. It is my strong feeling that we are at a similar point in our lives, where our emotions have piqued to historical levels. It is therefore incumbent upon us all to channel our feelings in the right direction. We must understand that every single Jew, of every denomination, is both our beloved brother and the beloved child of Hashem. These special, holy Jews from Pittsburgh, have been hatefully and mercilessly killed while they were communicating with Hashem, and killed for one reason - and one reason only - because they were JEWS, Hashems children. This type of killing renders each and every one of them as "Kedoshim" dying al kiddush Hashem, the highest level one can reach. I ask all of you to internalize this idea for the rest of your lives, and raise the respect you have for every single Jew, irrelevant of whether you,and they, agree on all or most issues. How often do we fall prey to looking down at another Jew - even in our own community - just because they may have a different hashkafah on a given issue. If we use this tragic event to inspire us to a heightened level of ahavas and kavod habriyos, these martyrs will have a tremendous aliyah and will live on within all of us. I also ask each and everyone of us to learn one Halacha a day from one of the Sifrei Chofetz Chaim, שמירת הלשון or אהבת חסד as an illuy neshama to all the kedoshim and as a meritto the injured of this horrible massacre, may they all have a refua sheleima bimheira. Rabbi Jeffrey Myers and Rabbi Jonathan Perlman saved lives with their heroic actions. Barry Werber was able to call 911 from his hiding place. They really look like a warm friendly congregations that looked out for the disabled brothers. This article is a is beautifully written. It made me cry. It talks about the chevra kaddisha and the volunteers who took turns watching over the bodies of the kedoshim. The reactions I read on Twitter show what a true Kiddush hashem this was. One Catholic woman was especially moved by The shomrim telling the volunteer taking them over, where they left of in saying Tehillim so they can continue from there. This article blew me away as well. I've never read anything like that in secular media before. The rabbi said, "We Jews are good at death" and that was a very moving sentiment. FTR, I assume you mean the suburb of St. Louis. A local school had a major dinner with a special Partners in Torah session preceding the dinner. After the learning, and before a very anticipated smorg, one of the school supporters led the group in Tehillim 130. Any reaction of a Rov acknowledging the tragedy and not making stupid reference to the denominations of the congregants. In the 5 towns, the video from Rabbi Bender and the letter from Rabbi Spiegel, both beautifully done. Do you have her contact info? I've been trying to think of something to do and this sounds like a great and beautiful idea. Our Rav sent out a letter to the shul saying the victims died al kiddush Hashem and for no other reason than that they were Jews. It was a very strong letter, and I was impressed. Our school had the kids write letters to the injured and have sent them to Pittsburgh. Ok. Great. But this should be obvious. It somehow was to the rest of humanity. 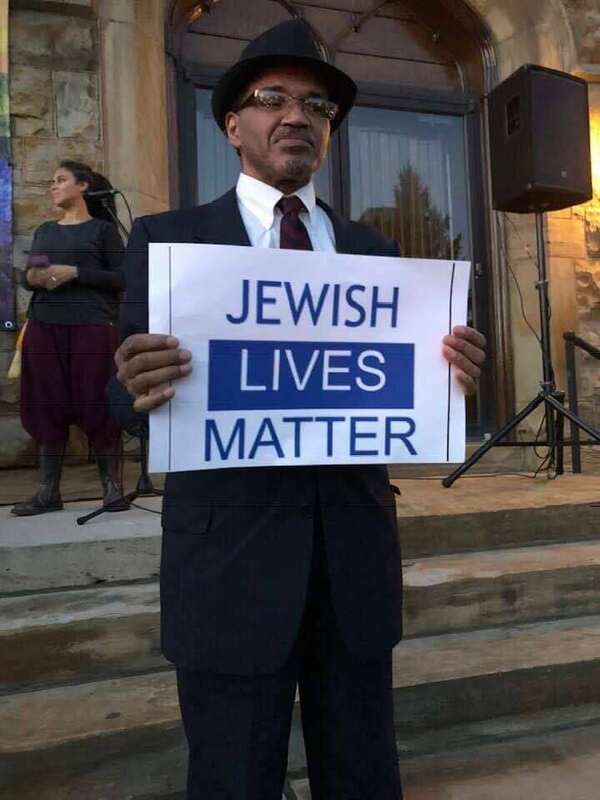 I saw a photo of a middle aged black man standing holding a sign that said “Jewish Lives Matter” in Pittsburgh. I can’t find it now to post a link. I believe in the caption or article it identified him as non-Jewish. I found that deeply moving and really appreciated that. I also found that the reaction of the Pittsburgh Jewish community overall to be wonderful. They seem like such a tight knit community even across sectarian lines. Sitting as shomrim, organizing the chevra kadisha, frum men walking with Dr Rabinowitz’ procession, the boys from the yeshivot and BY girls, frum ladies saying tehillim outside the shul. What a lovely community. After seeing them in action I’d definitely consider moving there. Because of these kedoshim, people that never put on tefillin in their life put on tefillin for their first time in their zechus. It's our only hope, and it's very possible that because of this first step of laying tefillin, it lit a spark within one of these people who will eventually return to Yiddishkeit. I saw this beautiful article in the Yated, and I tried to search their website but it doesn't seem to be there. The phone rang just as my husband and I were pretending that Shabbos was not yet out. S when I at last heard the long-awaited, dreaded list of kedoshim, tears sprang to my eyes. Because while I was positive I'd recognize the surnames and know the families, if not the actual individuals, I wasn't sure I'd personally know any of them. But there it was: "Rose Mallinger, 97". I picked up the phone and called home. My mother's voice was thick as she greeted me. "Rose Mallinger", we both said, holding back the tears. "Rose Mallinger of Ferree Street" added my mother, as if to distinguish her from any other Rose Mallinger. It was a violation of home and the things that make us feel safe, connected. "What kind of monster kills a 97 year old woman?" I demanded. "Who does that?" At that point I realized that the word "home" is relative for a Jew. You could live in Eretz Yisroel, and until the geulah sheleimah you will still be a target for hatred and jealousy. You could live in Squirrel Hill and call yourself "Conservative", but the g0yim know that a Jew is a Jew is a Jew, and let me tell you, they are jealous of our relationship with Hashem. Indeed, why target a 97 year old woman who never hurt a flea? I'll tell you why: At 97, Rose Mallinger still pucked herself up every Shabbos to go to temple. It many not have been my shul, or my brother's shul, but was a palce where Rose Mallinger reconginzed Hashem as her Creator. A place where she knew the difference between a holy day and a yom chol. Mrs. Mallinger, may Hashem avenge her blood, knew it was Shabbos and pushed herself to attend services every week in a country where assimilation is so great that teh Jews aer well on their way to dying out, at least according the Pew Report. That was what that monster wanted and needed to stamp out: the commitment to Hashem, the commitment ot Shabbos, and to bringing new generations of Jews into the world, which is what Rose Mallinger did. Her daughter Andrea, who at four years my senior was the cool teenager I looked up to, is lying in the hospital wounded. ... And there she was that Shabbos, sitting with her mother in shul when the bloodbath began. That is what the murderer meant to destroy. He meant to take down whole families, make others afraid to go to shul. He wanted to change the fabric of the Squirrel Hill Jewish community. Our job then, is to recognize that we must continue to hold our heads high as Jews wherever we live. We need to be proud to be Jews. We need to have children, and to raise gnereations as Jews, wherever we live. We need to be proud of our connection to our Creator. In one sense, the seemingly senseless murder of any elderly woman makes perfect sense: When that monster stole Rose Mallinger's life, he turned her into a martyr purified by fire. Someone had finally recognized what those of us from Squirell Hill had know all our lives: The closeness and beauty of Jewish life in Squirrel Hill was something holy, something to be emulated. The setting and the reason for Rose Mallinger's murder was the ultimate proof of this evident truth. And the facts of that truth could not be countenanced by those who wish to wipe out our people. Squirrel Hill was just too beautiful, too holy. That could not be allowed to continue, and so it must. So it may always be. Please post your pesach findings!